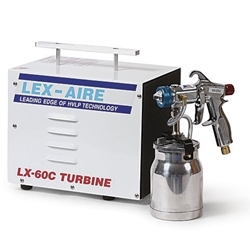 Lexaire turbines feature a heavy duty cabinet designed to stand up to years of professional use. The inside of the cabinet is acoustic foam lined for noise reduction. The motor mount forms a plenum chamber which isolates clean incoming air from the exhaust cooling air. All incoming air is drawn through a 3 micron washable main filter with 13 square feet of effective filter area that is 99.9% efficient. In addition the LX-60C also feature a washable foam pre-filter. This is the most advanced filtering system on the market for blemish free finishes and long motor life.